Antiquarium: Split w/ Draugûl, "Den Nordiske Sjel Lever I Meg (A Tribute To The Gods)", out there!! Split w/ Draugûl, "Den Nordiske Sjel Lever I Meg (A Tribute To The Gods)", out there!! Saudações, Guerreiros de Valhalla! 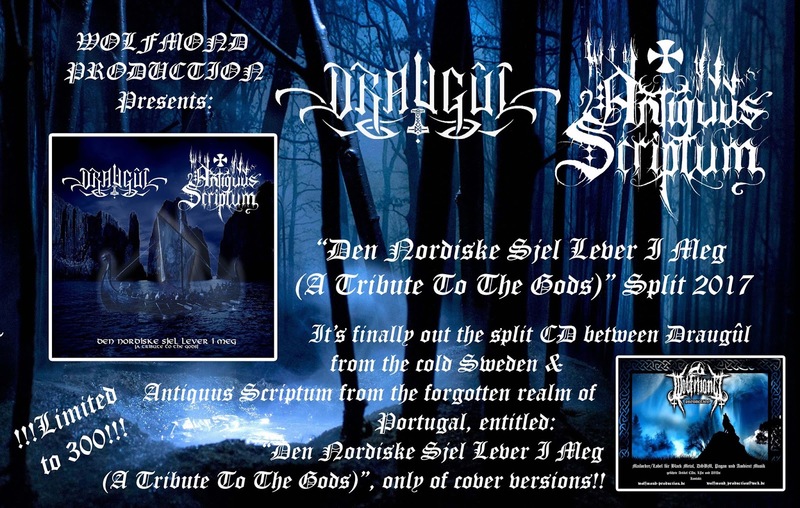 Passo só para dizer que já tenho em meu poder os CDs relativos ao split com Draugûl, da Suécia, "Den Nordiske Sjel Lever I Meg (A Tribute To The Gods)", editado recentemente pela alemã, Wolfmond Production, limitado a 300 exemplares em formato Pro-CDr. O split é feito inteiramente de versões de Metal bem conhecidas do público em geral, algumas delas nunca editadas e custa apenas 6€ + 1€ (portes nacionais). *Este split tem também edição tape pela ucraniana Depressive Illusions Records, limitada a 66 cópias, mas os interessados ainda terão de esperar + um pouco por esta edição... Os meus melhores cumprimentos e boa tarde a todos . Greetings, Warriors of Valhalla! I'll just pass to say that I already have in my possession the CD's related to the split with the Swedes, Draugûl, "Den Nordiske Sjel Lever I Meg (A Tribute To The Gods)", recently released by the German, Wolfmond Production, limited to 300 copies in Pro-CDr format. The split is made entirely of well known Metal versions to the general public, some of them never released before and costs only 6€ + 2€ (International shipping worldwide). * This split also has tape edition by the Ukrainian Depressive Illusions Records, limited to 66 copies, but the interested folks must please have to wait + a little more for this edition... My best regards and good afternoon to all. Very soon available through Wulfrune Worxxx! !